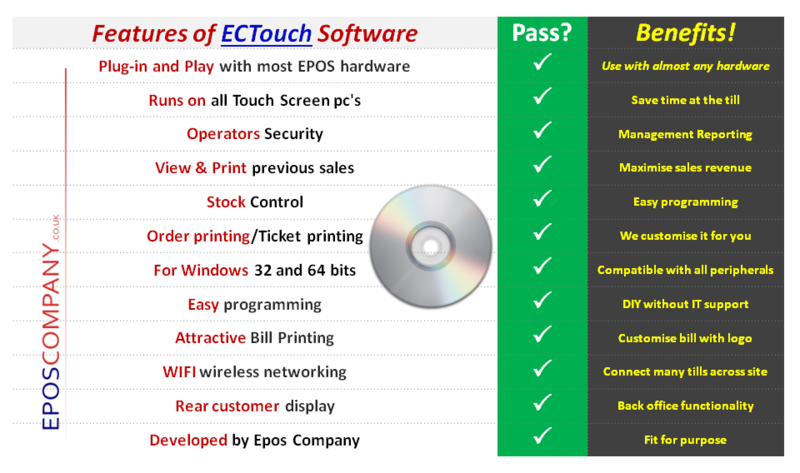 What exactly is ECTouch EPOS Software? 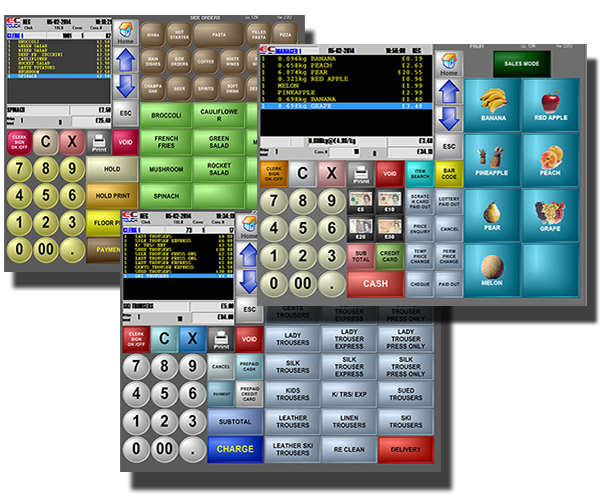 ECTouch is the front end EPOS software for processing sales and has been designed with ease of use in mind. ECTouch is currently being used in many Hospitality, Retail and Dry Cleaning environments. So, how will ECTouch EPOS Software appear on my screen? 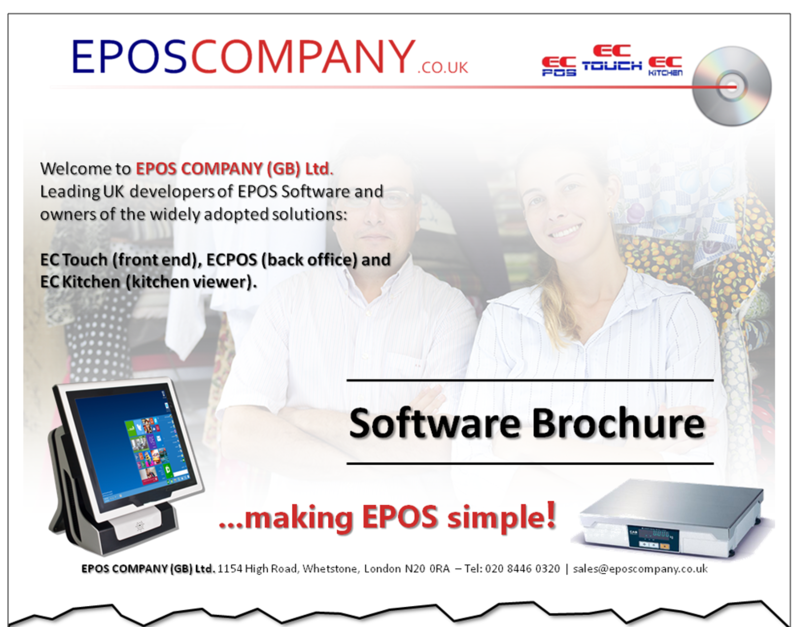 Is This EPOS Software Right For You? What is the best compatible back office EPOS software for ECTouch? ECPos back office software automatically collects detailed sales information from ECTouch via the internet or direct connection. File transfer communication help to maintain your ECTouch terminal from anywhere in the world. You can view the reports, manage the stock and update your products at any time. Is ECTouch EPOS Software designed to suit my food delivery business? Food delivery software that incorporates caller ID and post code address finder with full customer history. I need multiple screen display, can ECTouch EPOS Software do this? Combined with ECTouch you can now run a customizable second screen to display your current offers and advertisement as well as sales details. How can I link my waiting staff’s orders to my kitchen with ECTouch EPOS Software? Add a Kitchen Video System that is fully integrated with ECTouch software. With this system installed you will immediately enhance the productivity and efficiency of your kitchen. At a glance both Chef and staff can monitor orders as well as the status of orders. Can my ecommerce website sync with ECTouch EPOS Software? With our integrated Online Ordering your customers can order direct from your website with no commission paid to third party company, the order will then be captured and printed by ECTouch. Please provide a valid email address below, and a link to the ECTouch EPOS Software download will be sent to you. ECTouch has been designed and developed by EPOS company (GB) Limited, Established 1968. Highly effective yet simple user interface for operators and management, makes ECTouch a unique product. ECTouch runs on all touch screen PC based hardware. ECTouch is easy to use for both hospitality and retail environment. ECTouch software is currently in use in pubs, restaurants, fast food and delivery outlets, news agents, dry cleaners, general retail and many other bespoke applications. With over 45 years experience , ECTouch is being constantly enhanced with new features by in house programmers at Epos Company (GB) Ltd.
View and print old sales. Four price levels per item. Plu 2nd for helves and doubles. Fully editable floor (Table-tab) plan designed for ease of use in manager mode. Large buttons on keyboard for quick operation. Automatic price changes for happy hour, etc. Bar code scanning unlimited items. Easy item bar code replacement. Instant not found item set up in reg mode. Mix and match tables (buy one get one free).